View of the central courtyard of Terrace House 2 (TH2). In the center of the image is the open-to-the-air atrium that has a mosaic floor with a back and white square design. Also there is the (covered) head of an under ground cistern that collected the rainwater and evidently a fountain on the left side of it. Four covered porticos surrounded the open atrium (the portico on the left has been restored). The porticos all had mosaic floors and rooms opened off of each of the porticos. To view the remnants of the blue fresco on the left side of the image Click Here. In the foreground (lower portion of the image) simple frescos are visible on both sides of the doorway. This type of luxury dwelling is called a domus. 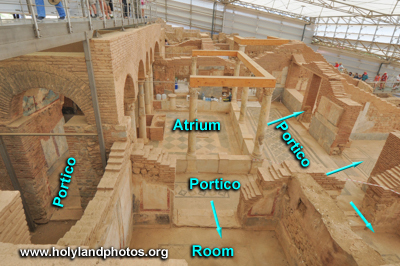 In the image below three of the four porticos are labeled and the arrows point to entrances to some of the rooms off two of the porticos.